Just when we were expecting the lamb market to continue its late winter and spring slide into the mid-500s, demand seems to have found some life. This week the lamb market rallied back to 5 week high despite increasing slaughter rates. Markets can sometimes defy even the most rusted on seasonal trend. A couple of anomalies caught our eye this week. Figure 1 shows the massive jump in lamb slaughter over the last two weeks, to the point where for the week ending the 18th August, we hit its highest level since the third week of 2017. In fact lamb slaughter last week was the third highest for the year. 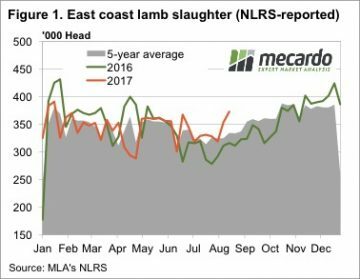 The 5.4% increase in east coast lamb slaughter was driven by a 10% increase in Victoria, with the 372,731 head the highest August weekly slaughter on record, by a margin of 3%. 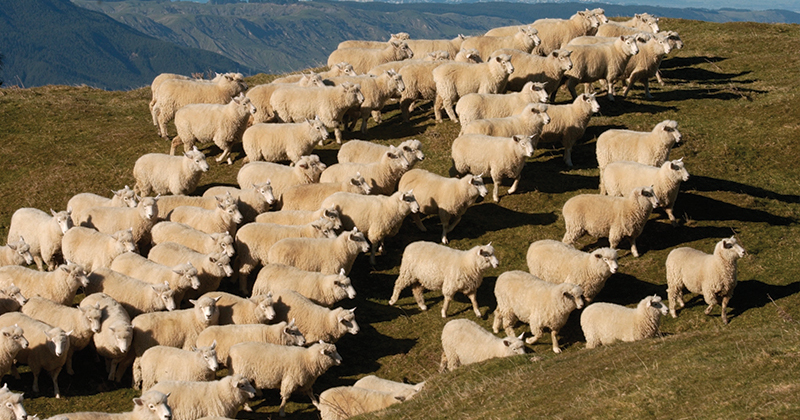 Despite the increasing supply, lamb prices managed to post a counter seasonal rally. The Eastern States Trade Lamb Indicator (ESTLI) gained 24¢, or 4% to 618¢/kg cwt (figure 2). The rise was on the back of increases in all states, 29¢ in NSW, 36¢ in SA and 8¢ in Victoria. 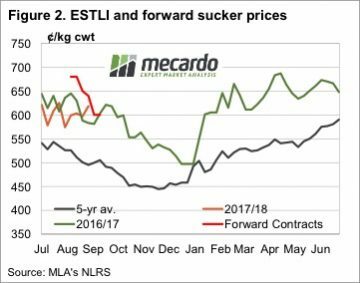 The higher ESTLI took it to within a few cents of the forward contracts released back in May and June. Up until now the forwards had been well in front, but stronger demand might see the markets in front next week. WA continues to lead the market, with the Trade Lamb Indicator gaining 6¢ to 666¢/kg cwt this week. WA Mutton values eased, but remain the most expensive in the country at 440¢/kg cwt. There has been some talk around about slow lamb growth rates impacting on the supply of finished lambs early in the selling season. While this could explain continued strong prices, the high slaughter rates suggest supply is ok, and demand may be pushing prices higher. We often say higher than normal slaughter early in the year bodes well for prices later on, and this is even more so when prices remain so strong.